This beautiful 1st floor condo overlooks the lake, woods and fairway of the 8th hole. Naples Heritage is a private gated Country Club Community. Presents a serene atmosphere, yet offers many available activities. Exclusive unlimited golf included with transfer membership and optional cart available for a minimal fee. Newly remodeled clubhouse, pool and hot-tub with seasonal poolside service. Ideal location for conveniences and entertainment. 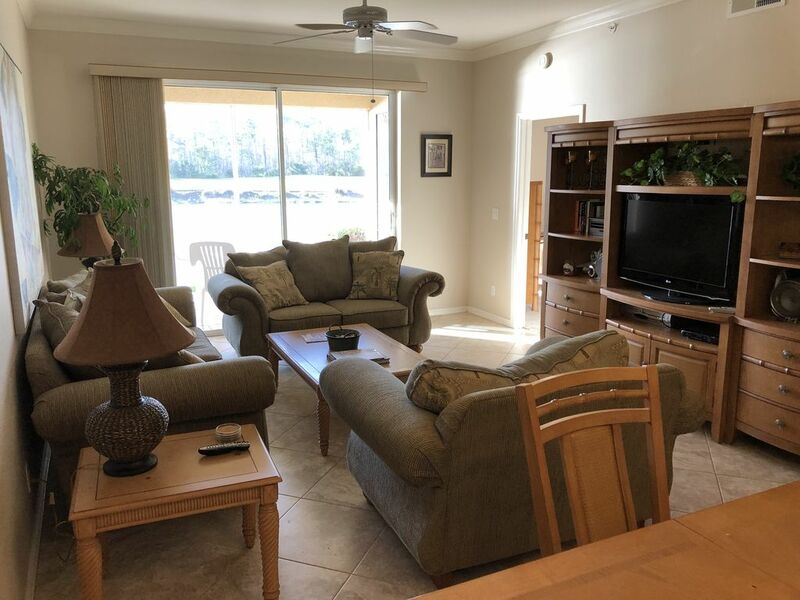 Fitness center, many tennis courts, pickle ball courts, additional private pools and bocce courts all within the community. Enjoy some outdoor exercise on the scenic grounds by taking a walk, run, or bike ride on the sidewalks throughout. Ten minutes away from Downtown Naples and Naples Beach. Plenty of nearby shopping, restaurants, and entertainment. We are a Midwest family with grown kids and happy to share our investment with you. It certainly has been our paradise and hope you have the opportunity to enjoy it as well. Overlooking peaceful lake and pristine 8th hole par 5 fairway with easy walk-out access. Overlooking peaceful beautiful lake and and palm trees and gorgeous nightly sunset.